Dmitry Zhilinsky (1927-2015) is rightly considered a key figure in the history of Russian art. His unique artistic method emerged as a truly extraordinary reflection of its time and provided a new direction for the Soviet school of painting for decades to come. When, soon after he painted them in the mid-1960s, Zhilinsky first showed his "Group Portrait of Student Sculptors", "By the Sea. Family", and particularly "Gymnasts of the USSR", he was acclaimed as one of the principal innovators among Soviet artists of his time. The work of Antony Gormley, a classic of contemporary British art, has long enjoyed worldwide recognition - today he is one of the most sought-after modern artists in the world. Every year, different countries host from five to ten new exhibitions of his sculptures, including large-scale open-air projects. Several of his works are permanently exhibited in the UK: among them the piece that brought fame to Gormley - “Angel of the North” (1998) with wings measuring 54 meters, in Gateshead in the North East of England, as well as “Quantum Cloud”, mounted in Greenwich by the Thames, and “Another Place”, sited in 2005 on Crosby Beach in Merseyside. Shortly before the Christmas and New Year celebrations, a show of Francisco Infante and Nonna Goryunova titled "Snow Meridian" opened at the Krymsky Val building of the Tretyakov Gallery. It is mounted in a special project section, which is the final stop in the enfilade on the upper storey housing the permanent exhibition "20th-century Art" and also serves as an entry to the section of the newest art trends located on the first storey. The borderline position of the exhibition space - between modern and contemporary art, tradition and experiment - determines the context framing the contemporary artists' exhibition as a part of the personal shows programme. The choice to present Francisco Infante's work as part of the Tretyakov Gallery's special projects programme is not accidental. Infante, who is known for breaking the basic conventions of art and crossing its accepted boundaries, shows us the harmony of creation through new forms and technical solutions; today, he is an acknowledged master. A Spaniard who grew up and lives in Moscow, Francisco Infante is one of those artists whose work defines today's art. Shortly before the Christmas and New Year celebrations, a show of Francisco Infante and Nonna Goryunova titled "Snow Meridian" opened at the Krymsky Val building of the Tretyakov Gallery. It is mounted in a special project section, which is the final stop in the enfilade on the upper storey housing the permanent exhibition "20th-century Art" and also serves as an entry to the section of the newest art trends located on the first storey. The borderline position of the exhibition space – between modern and contemporary art, tradition and experiment – determines the context framing the contemporary artists' exhibition as a part of the personal shows programme. 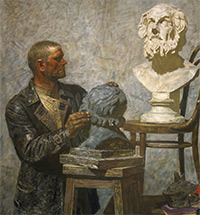 A retrospective exhibition of the artist-brothers Alexei and Sergei Tkachev, running in the Engineering Wing of the Tretyakov Gallery from April 15 through July 17, presents the oeuvre of two figures who in many respects define the trajectories of the Russian school of painting in the second half of the 20th and at the start of the 21st centuries. The exhibition features around 180 pieces representative of the main stages of their work and the main directions of their artistic explorations. The pictures on view include large-scale “exemplary” compositions, the results of the brothersÕcollective effort from the galleryÕs collection, as well as earlier paintings, from their Moscow studio, created by one or the other brother independently, and a large assortment of sketches. All this is but a fraction of the vast body of work created by the artists who continue working to this day. Shortly before the Christmas and New Year celebrations, a show of Francisco Infante and Nonna Goryunova titled “Snow Meridian” opened at the Krymsky Val building of the Tretyakov Gallery. It is mounted in a special project section, which is the final stop in the enfilade on the upper storey housing the permanent exhibition “20th-century Art” and also serves as an entry to the section of the newest art trends located on the first storey. The borderline position of the exhibition space – between modern and contemporary art, tradition and experiment – determines the context framing the contemporary artists' exhibition as a part of the personal shows programme. The art of Antony Gormley, a classic of contemporary British art, has long enjoyed worldwide recognition – today he is one of the most sought-after modern artists. Every year, different countries host from five to ten new exhibitions of his sculptures, including large-scale open-air projects. 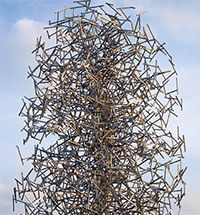 Several of his works are permanently exhibited in the UK: among them the piece that brought fame to Gormley – “Angel of the North” (1998) with wings measuring 54 meters, in Gateshead in the North East of England, as well as “Quantum Cloud”, mounted in Greenwich by the Thames, and “Another Place”, sited in 2005 on Crosby Beach in Merseyside. Alexander Vinogradov and Vladimir Dubossarsky created their “Seasons of Russian Painting” series especially for one of the rooms of the permanent exhibition at the Tretyakov Gallery's Krymsky Val museum. They are among the few modern artists who combine innovative approaches to expression with the tradition of largesized themed pictures with a carefully arranged composition. The anniversary exhibition of Valentin Mikhailovich Sidorov — Peopleʼs Artist of the USSR, full member of the Russian Academy of Arts, and Chairman of the Artistsʼ Union of Russia — ran in the Engineering Wing of the Tretyakov Gallery from November 13 through December 14. The retrospective continues the series of personal exhibitions of the masters of the generation of the 1960s, the “shestidesyatniki”. Today the rediscovery of the art of this period is an actual phenomenon. The exhibitions of Nikolai Andronov, Pavel Nikonov, Gely Korzhev, and Dmitry Zhilinsky were outstanding events of the cultural life of recent years. A contemporary viewer may see the phenomenon of the “shestidesyatniki” in a new light when comparing the work of different creative individuals who are often polar opposites. Thus, in the Tretyakov Gallery, along with the exhibition of Valentin Sidorov, there is the exhibition of Oscar Rabin, who also celebrated his 80th birthday this year. World War II left an indelible mark on the lives of these artists - their formative creative period was the post-war years, full of hardships. While their manner and individual style are so different, their formal searching is so varied, and the themes and plots are so unlike each other, that the art of their generation is charged with a special ethical and philosophical content that makes them stand out from the artists of the generations that followed.